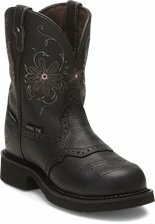 Standout style and protection unite in the 11" Lanie Waterproof Comp Toe Met Guard Pull-on boot from the Justin Gypsy™ collection. 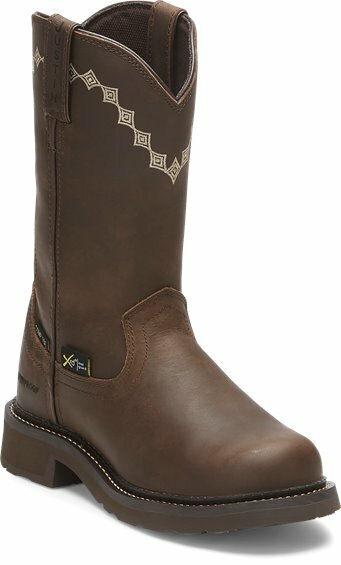 Set off with a tonal diamond stitch accent that follows the lines of the V-shaped shaft, this boot is equipped with every comfort and safety feature you need. The Met Guard with XRD® Xtreme Impact Protection and a composite toe let you work with confidence. Inside, The J-Flex Flexible Comfort System® insole provides comfortable support, and the dual density rubber outsole delivers the longevity and traction you need. 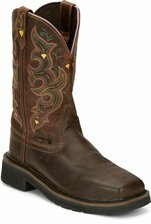 This Electrical Hazard-rated boot meets ASTM F2413-11, I75, C75 Standards.